Coriolus or turkey tail is a bit rebellious. Although its use has been forbidden by EU officials, Coriolus dares to grow in many places in the Czech Republic. More here. In therapeutic practice, Coriolus is the most powerful fighter with various types of pathogens, regardless of whether they are bacteria, chlamydia, viruses, yeast, borrelias, cocci, or cancer cells. It scans our body, searches for these pests, and then destroys them. To be precise, it does not do so directly, but through the individual cells of our immune system. Coriolus does this best of all mushrooms. Reishi is somewhat similar, but it's more nourishing and it better supports vitality. Chaga is also similar, but it is more focused on the digestive system. Coriolus has a much wider focus. It is the most commonly used mushroom for various oncological problems. It is administered in the cancers of the lungs, esophagus, breasts, cervix, uterus, blood (leukaemia), lymphoma (cancer of the lymphatic tissue, manifested by swollen nodes), intestines (with ABM, discontinue ABM after a month and administer the mushroom according to the actual condition), melanoma (skin cancer), brain cancer, generally in cancers under the navel. Whenever there are metastases. It can be used and it is good to administer it during conventional treatment, which is usually chemotherapy or radiotherapy. It both helps to eliminate cancer cells and helps the body to cope with the demanding conventional treatment, which is usually accompanied by many unpleasant side effects. It has a significant impact on viruses. There are studies and my practice confirms that it is excellent for the human papillomavirus - HPV, which can cause genital warts or even cervical cancer. It is excellent for other types of warts and cold sores (herpes). The large area of its activity associated with the above is the so-called "hidden pathogen". More and more people are coming to me with this problem. First of all, I want to clarify something about pathogens and parasites. Each person has millions of different pathogens in his/her body. Some do more damage, some less. Some are important to humans. And each person is also constantly surrounded by various, often aggressive, types of pathogens, which try to get into the body and steal some energy for themselves. We have to deal with it. We cannot get rid of all the pathogens around us and in us. It is much more important to build a strong immune system (the Chinese say: to strengthen our Zheng Qi, which is a wider concept than the immune system), in order for our immune system to keep all those pathogens under control. This depends a lot on lifestyle. However, we mostly do not live in an ideal setting, we eat as we eat, we work more than we should - we weaken our immunity, and then the pathogens begin to win. And this is the spell of medicinal mushrooms. They can both eliminate pathogens, and also strengthen our body to keep them "under control". This is due to the exceptional capabilities of medicinal mushrooms. No other herb does this so well. Now let's go back to "hidden pathogens." Imagine you have been ill with the flu. You take a little bit of a cure, you go to work. Symptoms disappear over time, the immune system prevails. But a part of the pathogen is deposited in the deeper layers of our body. And then just some weakness or stress is enough and the pathogen will begin to manifest itself. Mostly these are not strong symptoms, but very annoying. And very diverse: headaches, pains all over the body, sore throat, swollen nodes, malaise - as if your body were not yours, a feeling of high temperature, abnormal sweating, etc. Patients often describe it as “I think I’m coming down with something.” And the hidden pathogen can be anything, flu viruses, chlamydia, EB viruses, borrelias, yeast ... Coriolus is great for all of that. For example, in case of yeast it can be combined with Polyporus. Coriolus kills yeast, Polyporus eliminates their food (it drains moisture out of the body). It can also be used for acute respiratory infections. Higher doses are administered for several days. Usually with betaglucan. It can both stimulate the immune system, and – as most mushrooms – it can also dampen its response, if it is disproportionate. This is used in autoimmune diseases of the thyroid gland, rheumatoid arthritis, bronchial asthma, etc. Another good feature of Coriolus is that it can regenerate the mucous membranes. This is used for radiotherapy, also for asthma and sinusitis. It also helps the uterine mucosa, so it is given during preparation for pregnancy along with Cordyceps. It also has pronounced anti-inflammatory effects, both for acute and chronic inflammations. This is why it is used together with Reishi and Auricularia for inflammatory diseases of the locomotory system. Or with Chaga or Hericium for inflammation of the gastrointestinal tract – Crohn’s disease or ulcerative colitis. Or with Cordyceps for bladder inflammation. But only in the meantime, when the condition is not acute. If the condition is acute, Cordyceps is discontinued and doses of Coriolus are increased. Like most medicinal mushrooms, it has hepatoprotective effects, protecting and regenerating liver cells. It is used for fatigue conditions, often with Reishi or Cordyceps. Coriolus (Coriolus versicolor, Trametes versicolor, outkovka pestrá, Turkey Tail Mushroom, Chinese Yun Zhi, Japanese Kawaratake) is a wood-decaying mushroom, which belongs among the Polyporaceae and is not edible. Coriolus grows throughout the entire year and can be found predominantly on the living wounded and dead stumps of deciduous trees in the mild climate belt of Asia, North America and Europe. Sporocarps of the fungus are fan-shaped, hence the English name, and they form clusters, which are roof-shaped. The cap itself has a diameter of about 2-8 cm and it has typical beige strips on brown or grey background, the surface of the cap velvety. Coriolus was well known in bygone eras. In the complete texts from 1368 AD, that is, from the period of ancient China and the Ming dynasty, it is noted that Coriolus was used to strengthen health, both physical and mental, and to enhance qi energy. Coriolus is still used as a "medicinal plant" in traditional Chinese medicine. The "scientific" world discovered it only in the 1960s-70s. At that time, thanks to a Japanese scientist, the polysaccharide called PKS was extracted from Coriolus, which soon showed immunostimulating effects. Further experiments in 1965 confirmed that PKS also has anti-tumour effects. It was brought into clinical practice in Japan around 1980, and it has been a part of standard anti-cancer treatment in Japan since then. The same is true for Korea, where Coriolus is administered to up to 70% of cancer patients. Since the 1990s, a large number of clinical studies have been carried out, which confirm the effectiveness of Coriolus. 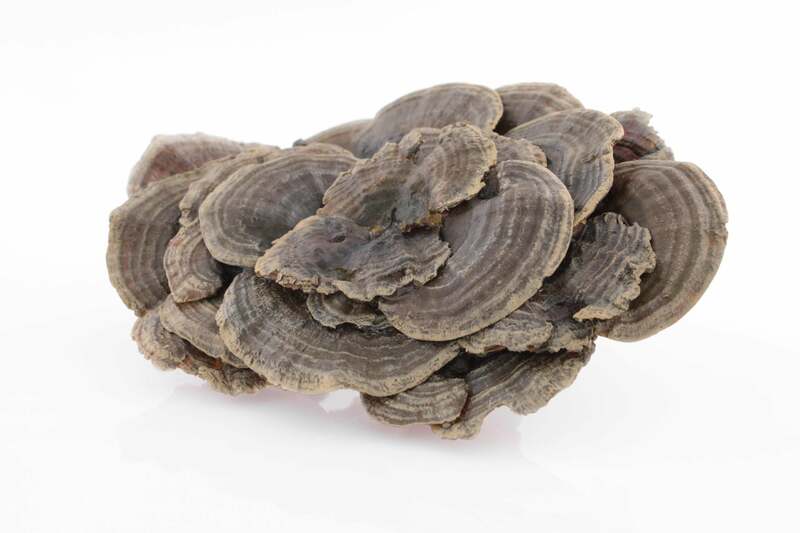 Coriolus, like other medicinal mushrooms, is a very powerful means of influencing many functions in the body, and of destroying both cancer cells and infectious pathogens. A great advantage is the possibility of using Coriolus for the elimination of pollutants in the environment. Studies working with Coriolus are mainly focused on its anticancer effects. Here is its greatest strength, which is such that doctors have been persuaded of bringing Coriolus to clinical research, and even clinical practice in Japan, where it has been included into the treatment of patients.